Marcus Armstrong has set the fastest laptime on Day 1 of the FIA Formula 3 pre-season testing today at Le Castellet, France. 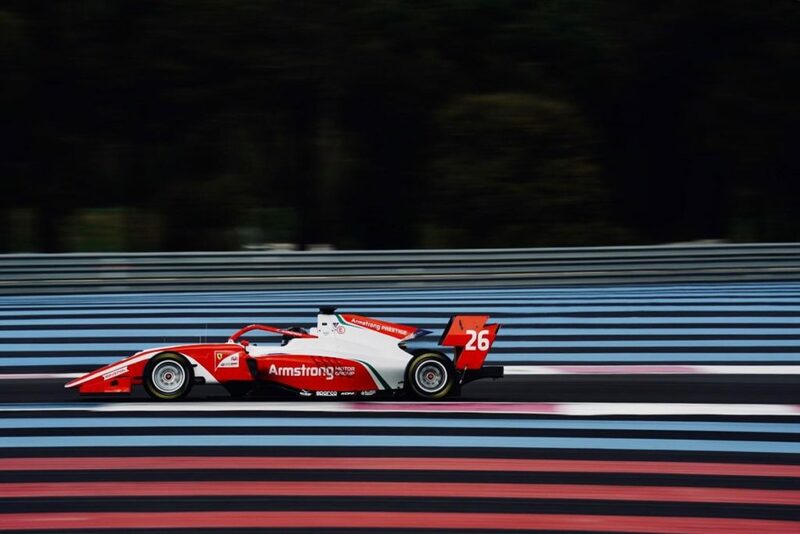 The Ferrari Academy driver was able to clock in a time of a 1:49.243 in the afternoon session to top the day overall ahead of Lirim Zendeli and Robert Shwartzman. The sun greeted the teams when the pitlane opened. Trident’s trio of Niko Kari, Pedro Piquet and Devlin DeFrancesco quickly hit the track to set their customary installation laps. The rest of the pack soon followed and within the first thirty minutes all thirty cars had had their first taste of the Circuit Paul Ricard. On the one hour mark, Raoul Hyman set the early pace, but Christian Lundgaard went top with a laptime half a second quicker than Jüri Vips in P2. The ART driver found some extra pace to break the 1m51s barrier just before a red flag halted the proceedings for a quick technical assessment. The pitlane went green again twenty minutes later and at shortly after that Leonardo Pulcini clocked in a laptime of 1:50.328 to go top, but Lundgaard was able to improve further by one tenth to reclaim P1. With thirty minutes left in the session, Richard Verschoor and DeFrancesco brought out a second red flag after the MP driver and the Trident man stopped simultaneously at turns 1 and 7 respectively. In the closing stages, both Lundgaard and Pulcini were able to dip under 1m50s with the Dane going quickest in a 1:49.685. Robert Shwartzman claimed P3 in the nick of time edging Niko Kari. At the chequered flag, Vips, Maximilian Fewtrell, Alex Peroni, Piquet, Verschoor and Logan Sargeant completed the top 10. After a two-hour break, the proceedings resumed with Andreas Estner (who is testing for Jenzer Motorsport this week) taking to the track first. Jehan Daruvala set the early pace in a 1:51.510 before a brief red flag period courtesy of Sargeant who stopped at the exit of Turn 7. Halfway through the session, Yuki Tsunoda went top in a 1:50.262 ahead of Sebastian Fernandez and Liam Lawson. Armstrong dipped under 1m50s just before another red flag period after Vips stopped at Turn 7. In the dying stages, Zendeli moved up to P2 whilst Shwartzman found some extra pace to feature in third place at the chequered flag. Pulcini, Verschoor, Simo Laaksonen, Fernandez, Lundgaard, Beckmann and Daruvala rounded up the top 10. Day 2 will start tomorrow at 9am local time.